Bob, one teaser is not enough. Engagement sessions require at least three photos. (I’m pretty sure it’s a law.) Excellent location for this! Nice shot and great location! I love this portraiture. Good work! Love the photo but I agree with Daniel, let’s see a few more. Share with us your gorgeous images. Nice engagement portrait. The venue looks alot like the Galveston area. Would love to see some more shots of the future bride and groom. Great shot of the bride to be and her future husband. Hope to see their wedding photographs in the near future! Great portrait work. 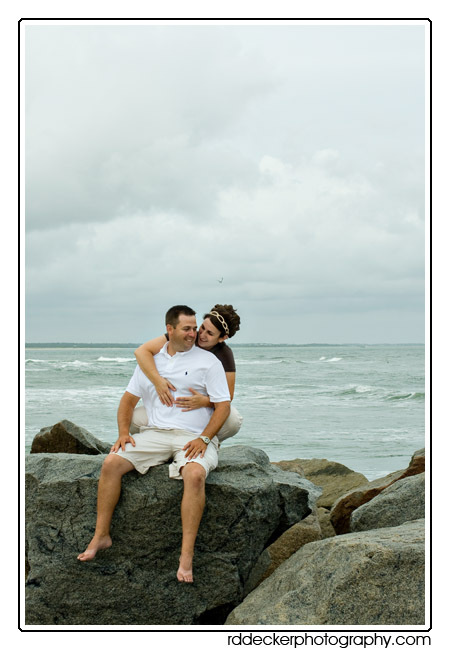 I just did a ocean shot for an engagement, but my couple had to wear heavy winter clothing! Nice job under difficult conditions! Great image! I love moody skies, wind though, not so much. Good job getting it done in less than great conditions! Beautiful photo I love the moody skies. What great scenery you have to work with! Great job! Hello There. I found your blog the usage of msn. That is a very smartly written article. I will make sure to bookmark it and return to learn more of your useful information. Thank you for the post. I will definitely comeback. Great contrast with the rocks and broad sky view.